Here’s more Taiwanese street food for you all today. 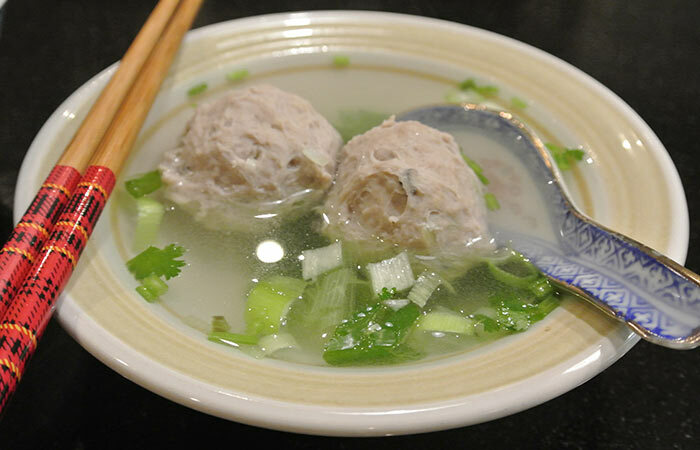 Do you love Taiwanese meatballs but can’t make them bouncy at home? These can be made with pork or beef mince but we have chosen to make pork ones in this recipe as they are the most popular. Please try Joanne’s recipe, and method in the video embedded below, to make the tastiest, bounciest Taiwanese Gong Wan 自製貢丸 – with all natural ingredients! Please get your pork mince ready with the following method: put the mince in a plastic bag and flatten it to about 1cm thick. You can see ours in the ingredients picture above with the egg on top of it. Then you break it up into small pieces before putting it in your chopper or blender. We had to chop/blend a third at a time as the machine isn’t so powerful. Do that until the mince meat changes from pink to light pink/white. This is very important to make your meatballs bouncy. 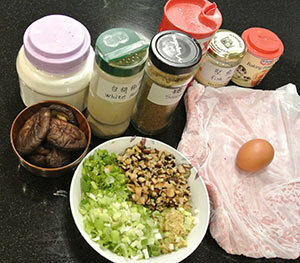 The above ingredients make quite a lot of Gong Wan, we had to cook them in to batches. When you’ve finished you can use them for the wonderful Gong Wan soup, like Joanne does at the end of the video. Please watch the video and see how bouncy these meatballs are! Great to hear your found us Joseph! Thanks for the compliment, I aim to show all English speakers the secrets behind Taiwanese cooking, recipes and street foods! thanks a lot for yet another great looking recipe of yours. I love your soups and recently have made the TW sesame wine chicken soup (mayo tsee ??) and for preparing it I went to the Asia Supermarket to get a refill on my Michiu and the lady there said it is about the right time for the sesame wine chicken soup. Anyway, I will make this bouncy meat ball soup soon, for sure. Thanks again and keep sharing your recipes !! as promised I tried out your recipe of the bouncy meatballs: fantastic!!!! Due to what I had left in the kitchen I changed a bit the ingredients to that degree that I didn’t used Chinese mushrooms, but the white beech mushrooms (Shimeji). I chopped them very finely as well as some spring onions, Chinese celery, ginger and mixed all with the spices and the half frozen minced pork …. The rest of the Shimeji I kept in total along with some coriander, stripes of carrot and celery for going into the soup itself. It worked out greatly. My Mom liked it a lot, too. So, this will be yet another of my (your) favourite soups, for sure. I’ve been craving for this food since i left taiwan 15 yrs ago, thanks i can now cook my favorite gongwan adobo. I’m very happy to hear this is so useful for you! Good luck with your cooking, come back again! I already did it but my meatball was not that bounce and elastic that had to be. I have no idea which step i have done wrong. Can you give me any suggestion? Try blending the meatball mixture for a longer time Edward. It should get very white over time.